How to apply for home grants is among the very top subject I receive inquiries from my readers. So I decided to create a page with some Answers and Details that will help you get some DPA money right where you live. They may vary from estate to estate, from county to county – and sometimes even within the same county if it happens to have more the one city in that county …or there may have different areas that officials want to develop or redevelop …but most “must know” details are here. You will receive public money so they want to make sure that you have a reasonable expectation of paying the mortgage - so you need to follow todays rules as much any other borrower who is not receiving a DPA. Hire a real estate professional [REALTOR] who knows the area and is willing to work with such transaction – some agents will not. Just look for one that will work with you – tell him / her that you need to use a DPA otherwise you might not be able to buy a home now. Your city / county may have a different name – they tend to be creative – but they are right there by you – I can guarantee. When I built my page Homeownership Programs [please click here], I had the opportunity to verify that down payment assistance can found not only on each of the 50 states, but also in Puerto Rico, as well as in the territories like Guam and the Mariana Islands – I am happy to tell you! So it is just a matter of looking around and knowing how to apply for grants and …dare I say it? Be diligent! 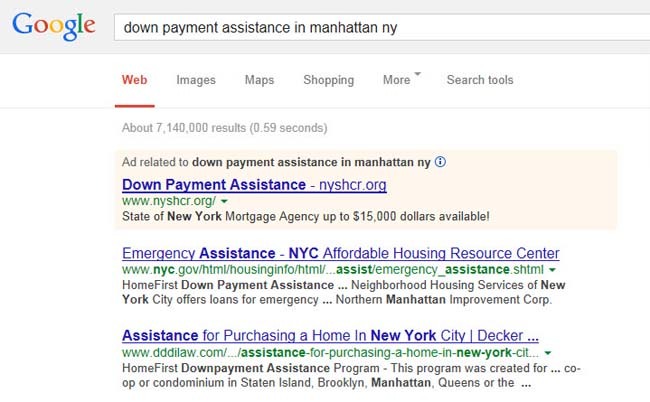 Google some of the terms used here and then add your state/ county/ city at the end of the tag. I have just made such test [not that I needed any proof that this works] but just out of my curiosity why so many people have such difficulties connecting with on how to apply for home grants. 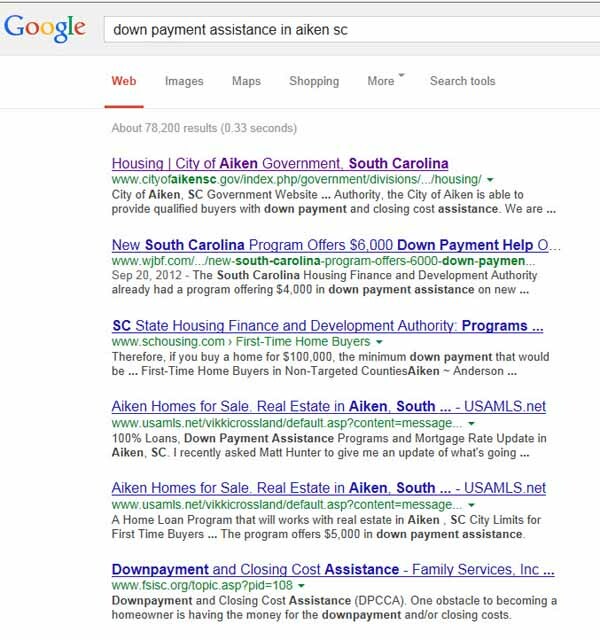 So here is what I googled: down payment assistance in aiken sc – this was posted here straight from my browser. 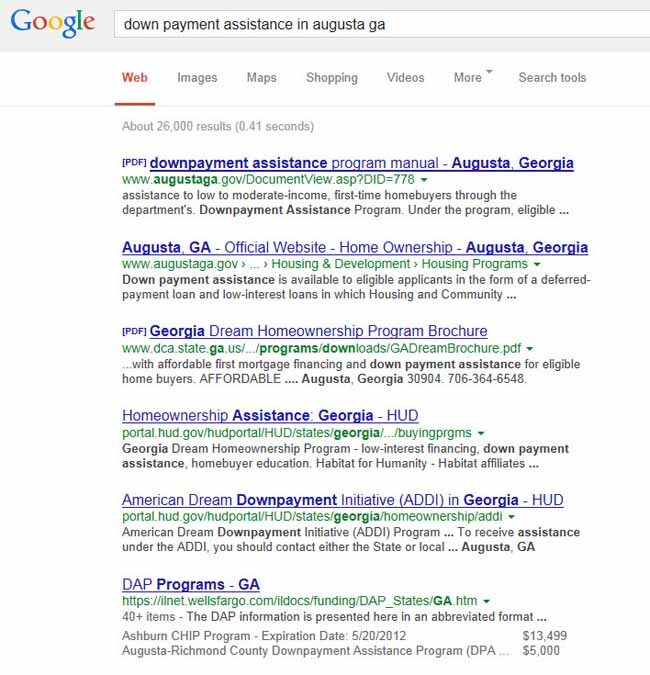 I marvel at it each time I search about home grants AND it is available in every neck of the woods – including yours! For y’all reading this page from across These States maybe it does not ring the bell where and what Augusta, GA is. So let me give you another hit: It is the home to the August Masters – arguably the most prestigious golf tournament in the world. We are very proud of it around here. Well, Augusta is also a historic city with its many highly regarded neighborhoods and high end homes. Note: I think that it is a stretch to be looking for affordable homes in these high end area ...but you ought to find something close by.